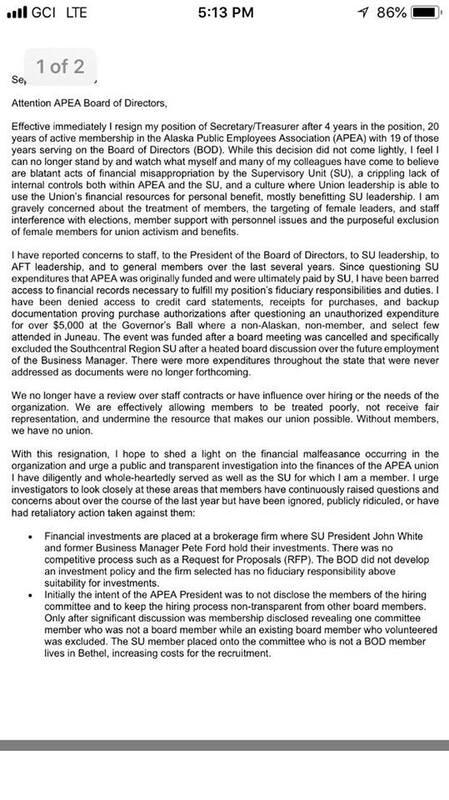 The secretary and treasurer for the Alaska Public Employees Association/American Federation of Teachers (APEA/AFT), Cris Sanders-Porter, has resigned her position citing financial malfeasance and mismanagement. The Landmine has obtained her resignation letter, which was sent to multiple State employees. According to the letter, she has been secretary and treasurer for the last four years and has been in the APEA for 20 years. 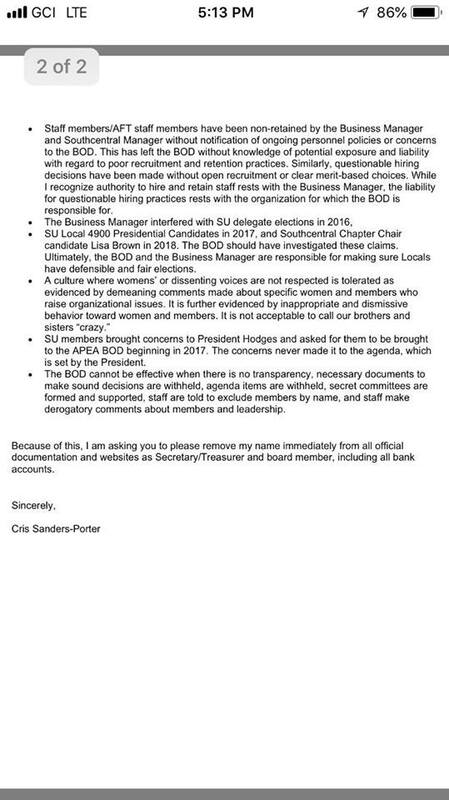 In the letter, Sanders-Porter says, “I am gravely concerned about the treatment of members, the targeting of female leaders, and staff interference in elections, member support with personnel issues and the purposeful exclusion of female members for union activism and benefits.” The letter goes on to say she has reported this to the president of the board, leadership, and members. Since questioning expenditures, she says she has been barred access to financial data. She lines out everything in eight bullet points. She makes some serious accusations including financial mismanagement, election interference, and a culture where womens’ or dissenting voices are not tolerated. She says that this has all been ignored by President Cecily Hodges. At the end she asks for her name to be removed from all documentation and websites. The APEA/AFT website currently shows the secretary/treasurer position as vacant. I reached out to Sanders-Porter and the APEA/AFT for comment. Sanders-Porter has not yet responded and the APEA/AFT said they will get back to me. The story will be updated with any new information.